Our first semi-custom bicycle has left the building. Here's her backstory. Meet Sara: A former baker, current professional quilter and all-around talented gal from Washington. Sara grew up riding bikes, but only recently got back into riding through competing in triathlons. And then the bike bug really bit her. She decided that she loved her light weight racing bike, but that she also wanted a bike that could do a bit more. She wanted a bike that she could ride to and from work, a bike she could load up with panniers and take camping, a bike she could take grocery shopping, a bike that she could make a part of her everyday like. And also, she wanted something that was unique. A bike that not only fit her riding needs, but also her body and her personality. A bike that you couldn't just buy off the shelf. 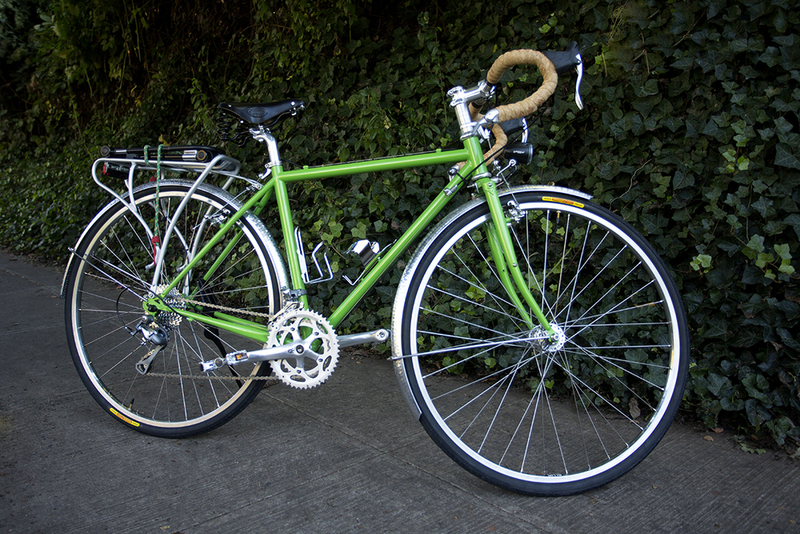 Meet Sally (the bike): A light-touring and commuting bike that's equal parts personality and functionality. But, it's more than the components and build specs that make her so special. It's the way that her green paint job sparkles in the sun. It's the gel-lined cork handlebar tape that provides just the right about of class and cush. It's the bird-shaped water bottle cage that you can't help but smile at. It's the bell that produces the perfect 'ding'. It's the knowledge that no one else on the road has anything like it. She's a one of a kind, just like her owner. Sally in all her green glory. Photos by www.bruceandre.com. Thanks Bruce! Interested in getting your own semi-custom bicycle built? Drop us a line at hello@gladysbikes.com. Let's talk.